There is certainly no shortage of burger joints in the Albany area with Smashburger, BurgerFi, Burger 21, Crave, and many other burger-centric places scattered throughout the region. 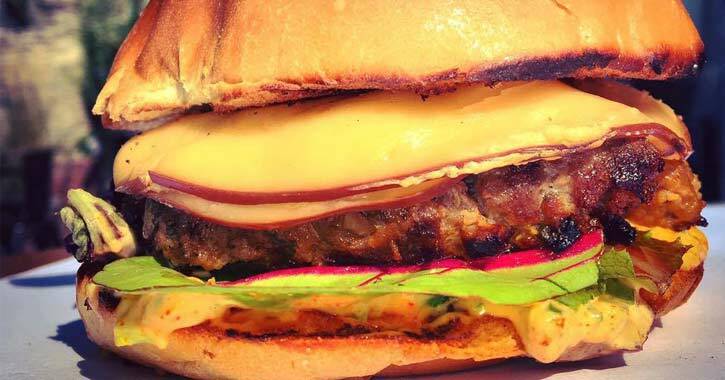 And while it's easy to head to a familiar spot when your burger cravings hit, you will miss out on a number of other great eateries that offer a truly delicous and unique take on this classic American food. In fact, the following Albany restaurants serve up such a wide array of succulent, burgerlicious options, your only problem will be choosing a favorite! Want to hear some great live music while enjoying a mouthwatering burger? Head to The Hollow Bar + Kitchen! 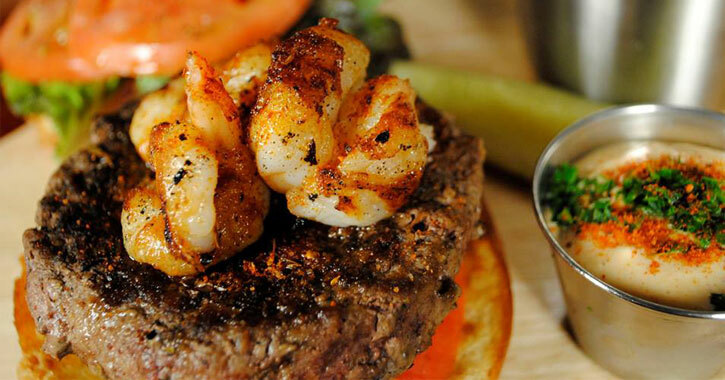 It has one of the best live music scenes in Albany along with several fantastic burger options: the Surf and Turf Burger, pictured above, with grilled and butterflied shrimp and a house remoulade; The Hollow, with a fried egg and house habanero ketchup; and The Standard, for those looking for a more classic burger. The Hollow also has a Salmon Burger and a brand new vegan burger, The Beyond - a 100% vegan "Beyond Meat" plant-protein, soy-free, gluten-free burger. Lark Street is known for having great restaurants and shops. Next time you're on this historic Albany street and find yourself craving a burger stop by Lax on Lark. 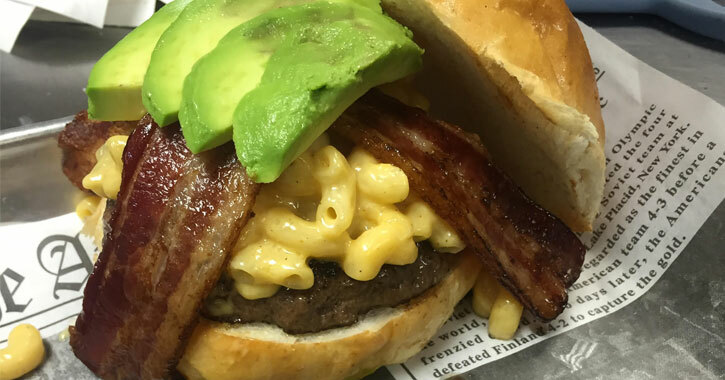 The Bacon Mac and Cheese Burger, pictured above, hits all the tastebud hot spots. They also have a Jack Daniels Burger with Jack Daniels sauce, and a Sriracha Burger, with jalapenos, bacon, and Sriracha aioli. You can expect an inviting atmosphere and exquisite food at Lax on Lark. They also host events like live comedy shows, live music, karaoke, trivia, bingo, and more. 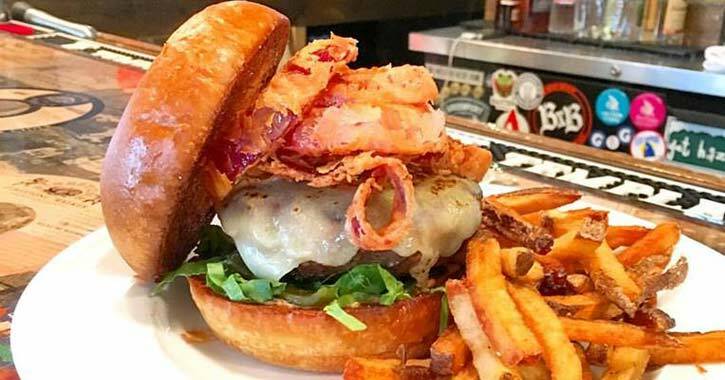 They don't just have a great beer selection - the Albany Pump Station makes a mean Pump Station Burger: ground beef blended with their award-winning brown ale, scallions, and cheddar Jack cheese, then topped with barbecue sauce, bacon, pepper Jack, chipotle Ranch dressing, lettuce, tomato, and onion. Choose from a number of specialty beers to go along with your burger like Pump Station Pale Ale, Quackenbush Blonde, or Oatmeal Stout. These folks know their beer, so don't hestitate to ask if they have a pairing suggestion for their classic burger. 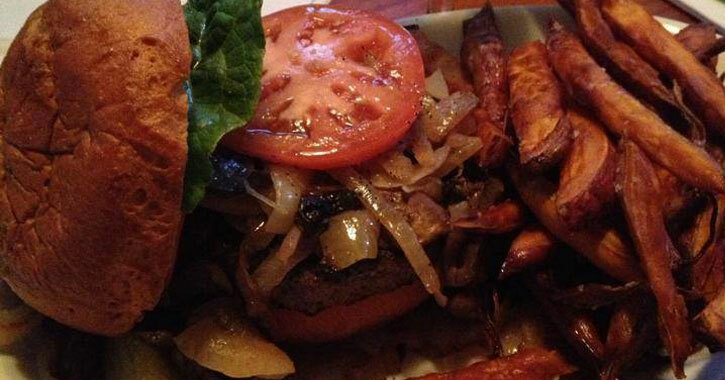 Although they have a few standard burgers on the menu, Capital City Gastropub often has a "burger of the day," such as the one pictured here, the "Onion Ring of Fire Burger." This burger consists of Kilcoyne beef with onion rings, spicy aioli, pickled poblanos, cheddar, and lettuce. In addition to switching up their burgers, they also change up their menu with the seasons so as to better source from local ingredients. And, they have a constant rotation of 12 different craft beers from across the country. 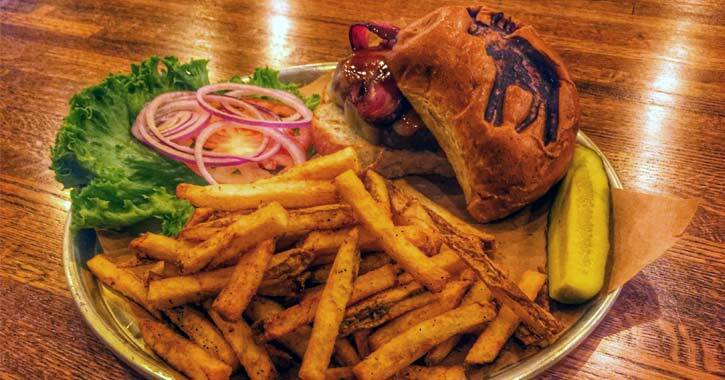 If you're someone who likes to try different kinds of burgers and other food instead of always going for the same thing, the Capital City Gastropub is probably the restaurant for you. The Pearl Street Pub offers a traditional burger, a PSP Burger with an onion ring and gold rush BBQ sauce, a Black and Blue Burger with bleu cheese crumbles, a Juicy Lucy Stuffed Burger with caramelized onions and bacon, and they also have a Black Bean & Falafel Burger which is both vegetarian and gluten-free. This downtown Albany eatery is among all the action on Pearl Street, they have an upscale dress code on Saturdays for a little bit of a fancier atmosphere, and they also offer an outdoor patio during warmer weather. You'll find classic pub fare merged with international dishes on the menu at City Line Bar & Grill, which prides itself on being an upscale bar and grill. What better pub fare could one ask for then a combination of a burger and macaroni and cheese? 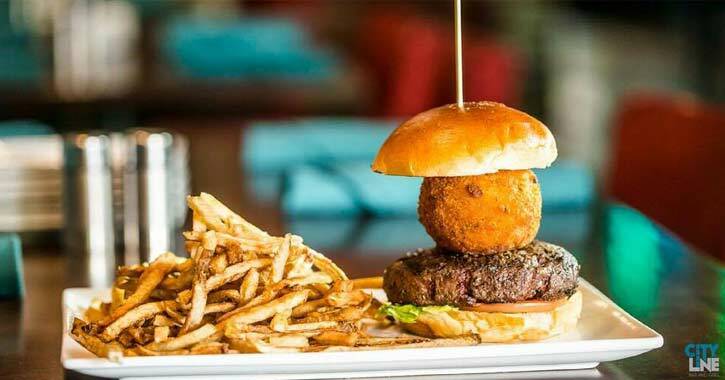 Look no further than their Mac Burger, with a beef patty and a fried mac and cheese ball. Yum! They also have a Goddess Burger with a number of delicious vegetables: roasted peppers, cherry tomatoes, portobello mushrooms, and arugula, along with onion jam, feta cheese, and a yogurt garlic sauce. All of the burger meat used at Garden Bistro 24 is from Herondale Farm in Ancramdale, just about an hour away, and it's all 100% grass-fed organic beef. Pictured above is the Classic Bistro Burger with local goat cheese, caramelized onions, baby spinach, tomato, and a roasted garlic and rosemary aioli. 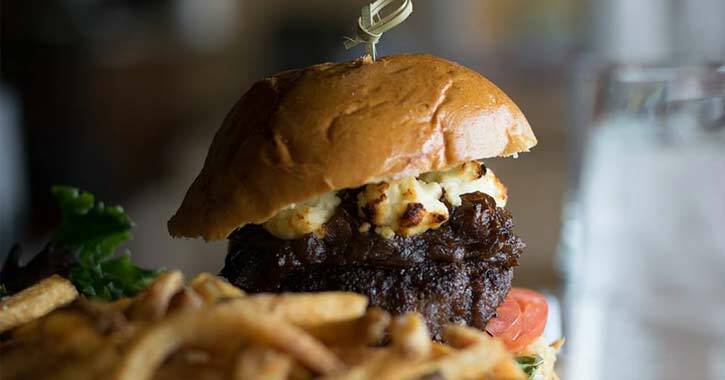 Other burger options at this classic bistro include the Pigoudet, with sauteed mushrooms, Swiss cheese, crispy onions, arugula, and a horseradish cream sauce. You could also try the Parisian, with applewood smoked bacon, caramelized onions, brie cheese, truffle Dijon aioli, and crispy potatoes. Vegetarians might want to try the Quinoa, with sauteed kale, house-cured pickles, avocado relish, and aged cheddar cheese. The Hill at Muza describes themselves on their website as "a bar, a beer garden, a European staycation." Pictured above is their Euro Burger, with an all-beef burger, smoked gouda cheese, spicy remoulade, greens, and a brioche bun. They also offer a Continental Burger with "bacon gastrique," gorgonzola cheese, and pickled red onions. You'll definitely want to check out their European-style hidden garden on site, open year round with beautiful flowers and a waterfall during the warmer months, and a ski lodge feel in the colder months. The Tipsy Moose Tavern has been doing quite well since they opened in June of 2016 where the Lager House used to be in Latham. Along with an extensive selection of beers and great pub food they offer up fantastic burgers all made with classic angus beef. Pictured above is the Bullwinkle Burger, served up with smoked bacon, aged cheddar cheese, and house made honey barbecue sauce. 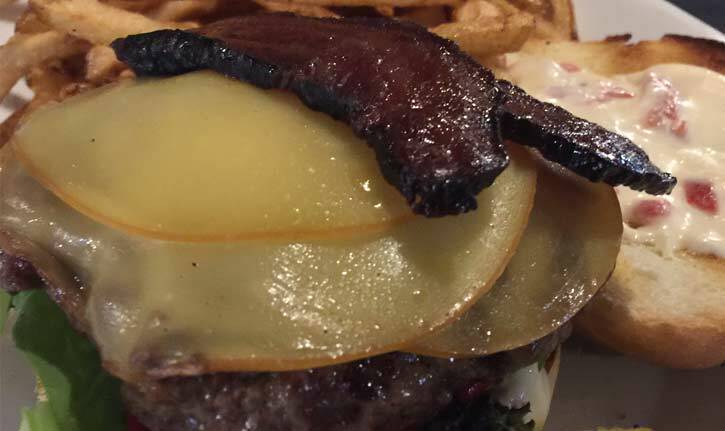 The detail of the moose on the bun just brings this burger up another notch. Pictured above from The Ruck is The Roxanne: an 8oz hand-pressed patty consisting of short-rib, chuck, and sirloin, then topped with smoked gouda, spring greens, and a garlic red pepper aioli. They also offer an EO burger with onion rings, bacon, and a house made barbecue sauce and several other tempting options. The Ruck has been widely recognized as a prime craft beer bar in the area - choose from a wide selection of foreign and domestic craft beers to pair with your burger. 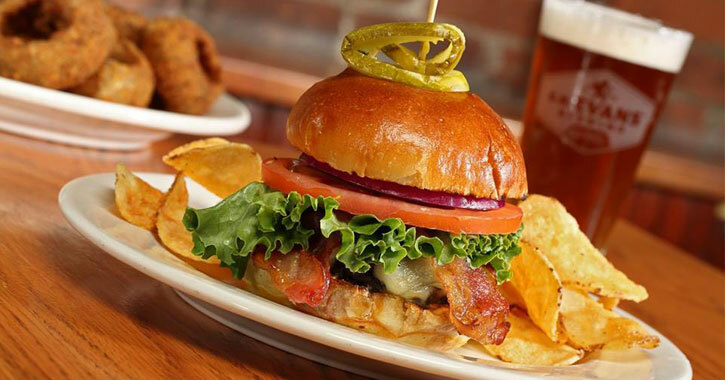 At The Ruck, you can enjoy the best of both worlds with an incredible burger and excellently brewed beer. Are you ready for this burger? 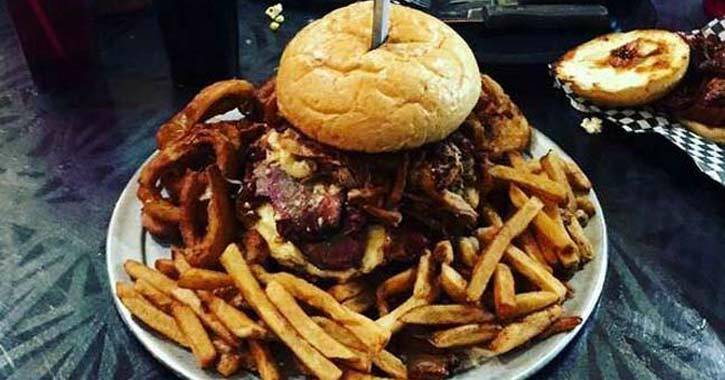 The Graveyard Burger at Wagon Train BBQ consists of: 1 pound black angus beef patty, 4 slices of cheese, 2 fried eggs, 6 slices of bacon, 8 oz pulled pork, 8oz beef brisket, 8oz cole slaw, 8oz mac and cheese, and jalapeno bottle caps. If that's not enough for you, it also comes with onion rings and French fries. Also available at Wagon Train BBQ is the Tombstone Burger with a black angus burger, pulled pork, KC barbecue sauce, cheese, a fried egg, and coleslaw. Although they take their burgers quite seriously, Wagon Train BBQ also has a number of appetizing wood fired pizza options.